For those who may not have been paying attention: Steve Ditko drew the pictures, Stan Lee wrote the words. But “writing the words” does not simply mean “deciding what each character should say” or “deciding what text should go in the caption box.” It means “deciding which characters should be speaking and which ones should be silent”; and “deciding whether a panel needs a caption box or not.” We have to imagine Stan looking at text-free page, and starting to bang out copy on his typewriter. "I think Aunt May is talking in this scene, and Peter is sitting at the breakfast table in silence. I think all five of these character should have something to say. I think this panel needs a little yellow and black box to explain what is going on." He seems to complete his text for one page before going and looking at the art on the next; and he rarely checks to see what happened last month. He is poor at foreshadowing. On the cover of issues #22 he shouts “New thrills! New villains! New surprises!” But there are no new villains this issue; just some old villains under a new name. And on the splash page he tells us “take a good long look at the Ringmaster…he won’t be around very long.” In fact, the Ringmaster appears all the way through the comic (trying to make off with the stolen paintings on the last but one page) albeit separated from from his team-mates. Page 5 of issue 22 is a good example of Stan Lee’s over-writing of Steve Ditko’s narrative. I have picked this page because of one very remarkable panel; but you could play the same game with almost any page in the canon. It is no part of my brief to say that what Stan Lee does is wrong. But an understanding of what Stan does, in fact, do is key to grasping the multi-dimensionality which makes the Amazing Spider-Man so unique. Panel 2: A brown haired girl stops the boy as he is walking home. Panel 3: The girl, head bowed, apologizes or confesses to the boy about something. The boy, head cocked to one side, listens. Panel 5: The girl and the boy walk off arm in arm. Liz: Peter, will you walk me home tonight? Peter: Sorry Liz, I can’t. Betty: I apologize for jumping to conclusions about you and Dorrie yesterday. Peter: I accept your apology. Betty: I am so happy you have accepted my apology! Peter: Now we’ve made it up, what she we do? 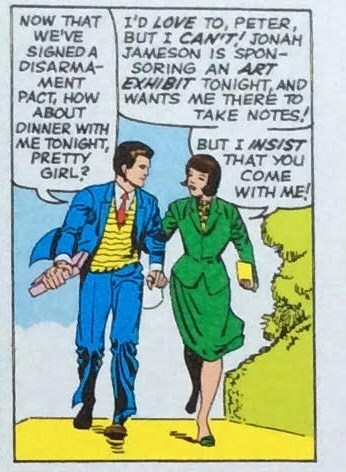 Betty: Let’s go and see Mr Jameson’s exhibition of modern art. Of course, we would expect Lee, or any writer, to provide something much more dramatic and flowery than this. But Stan Lee’s adds far more than is necessary for explanation; he adds ideas which aren’t in the pictures, and and subtly changes the meaning of what Ditko has drawn. 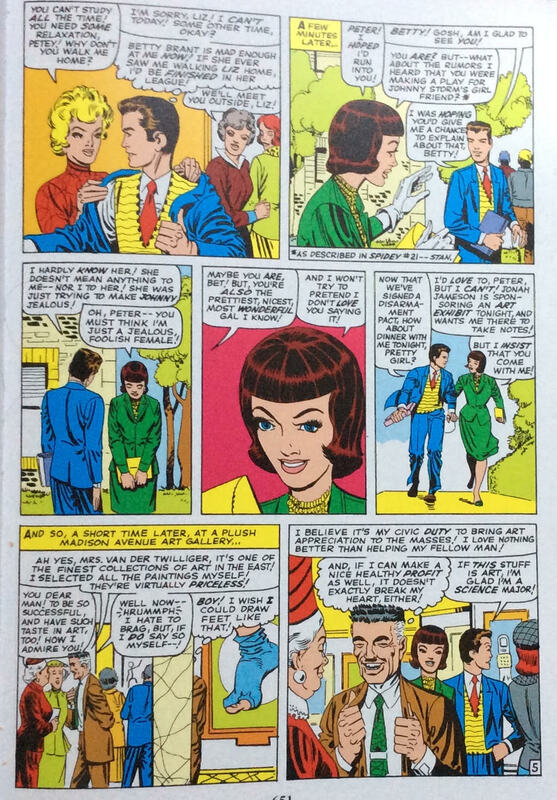 Liz asks Peter for a date; Peter turns her down. 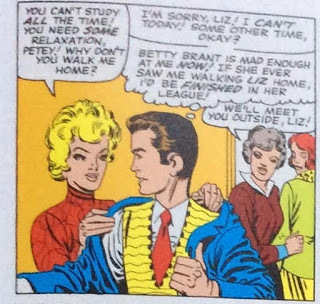 Liz is no respecter of personal space — remember her slicking back Peter’s hair in #17 or straightening his tie in #15. (Peter looks slightly irritated but this isn’t taken up in the text.) Lee likes every issue to be as self-contained as possible; new readers rarely feel they have missed anything. So it makes sense for Peter to add an explanation about why he won’t walk home with Liz: “Betty Brant is mad enough at me now! If Betty ever saw me walking Liz home, I’d be finished in her League!” Note that he intends never to be seen out with Liz again, but tells her that he’ll walk her home “some other time”. In two issues time, he will actually go to her house to help her with her homework. Stan can’t help presenting Parker as a bit of a hypocrite. Quite clearly, Ditko intends this panel to represent Betty and Peter greeting each other, and the next panel to represent them settling their differences. But Lee gets ahead of him, and puts most of the substance of the conversation into this frame. Faced with a small panel containing two characters, most writers would add one, or at the most two, speech balloons: but Lee gives us four. 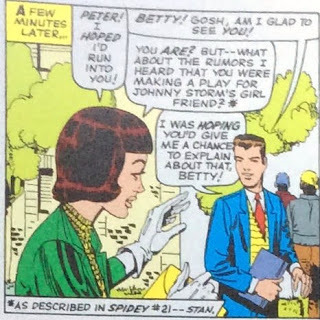 This means that we have Betty waving to Peter and saying “But what about the rumours I hard that you were making a play for Johnny Storm’s girlfriend?” and a smiling Peter responding “I was hoping you’d give me the chance to explain about that, Betty!” This is just how he writes fight scenes: asking us to believe that characters are speaking 20 or 30 seconds worth of dialog over a frame which represents a fraction of a second’s worth of action. If anyone follows up Stan Lee’s footnote they will find that Betty’s dialog clashes with what happened in issue #21. 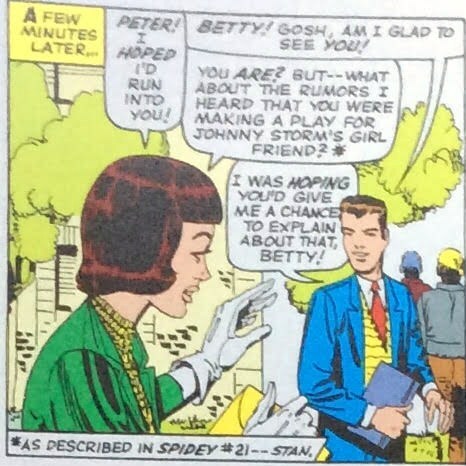 Betty didn’t hear rumours; she specifically saw Johnny accuse Peter of hitting on Dorris; refused to let him explain; stormed off in a huff; and leapt to the conclusion that Peter was on a date with Dorris when she is told by Aunt May that he has gone out. Peter’s explanation of the gossip — blaming the whole situation on Dorris Evans — is astonishingly ungentlemanly. The Torch came after Peter because he saw him coming out of Dorrie’s house — Peter had, in fact, been quite innocently returning a lost purse. 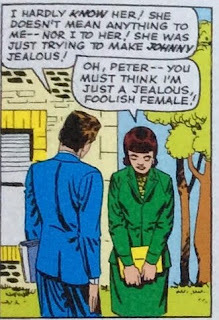 Dorrie did, in fact, talk to Johnny about Peter, with the intention of making Johnny more of a gentleman, but Peter couldn’t possibly know anything about this. In fact, it was him who, as Spider-Man, went back to Dorrie’s with the intention of making the Torch jealous! Peter manages to out-talk Betty in this panel even though he is not in it. Clearly, Ditko meant it to contrast with the previous one; a long shot of Betty with her head bowed, looking sad, followed by a close up of her with her head up and looking happy. She is clearly meant to be saying she’s happy Peter has accepted her apology, or expressing pleasure that they are talking to each other again. 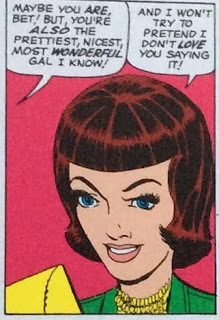 But Peter still talks across her: Lee uses the clumsy device of a speech bubble coming from out of frame, telling Betty that she is the “prettiest, nicest, most wonderful gal I know”, leaving her to simper that she likes hearing him say so. And off they trot, arm in arm, to J.J.J’s art show. It is, by the way, pretty tactless of Peter to describe their reconciliation as “signing a disarmament pact”, given that Betty’s friend Ned is off in Europe covering a peace conference. The final two panels have been discussed a great deal, but I don’t think anyone has ever really grasped their oddness. It is too easy to jump into Stan Lee’s head an assume that if something happens on the page, it was always going to happen on the page, because Stan Lee meant it to. 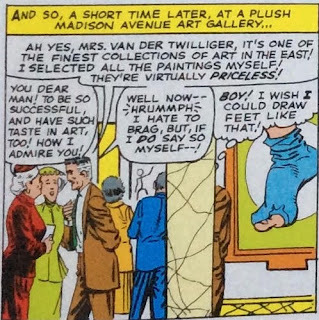 As exposition, the two panels tell us what we need to know (it’s Jameson’s private collection of art, and he is very proud of it); they also give us a nice little character moment: Mrs Twilliger flatters Jameson for his good taste; Jameson hypocritically boasts that he wants to make art available to ordinary people, while inwardly admitting that he’s only in it for the money. We can see three pieces of art in the exhibition: a childish drawing of a stick man; a sketch of what appears to be a finger with a sticking plaster on it; and a human foot, in a blue sock, with one toe sticking out. 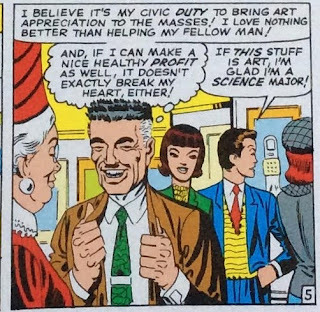 Peter remarks in panel 7 “If this stuff is art, I’m glad I’m a science major!”, which is consistent with the dismissive expression Ditko has drawn on his face. Last issue Dorrie praised Peter Parker for being cultured -- but he isn’t hip. head and Mrs Twilliger's hat! The exhibition is supposed to be taking place “at a plush Madison Avenue Art Gallery”. (The Bugle offices are also on Madison Avenue.) In real life, the fashionable Bodley Gallery, associated with the “pop art” movements, was located at 787 Madison Ave It is unlikely that Ditko (with his Randian suspicion of intellectuals) would have had much time for modern art. 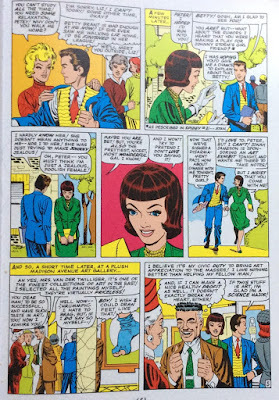 His own panels were never appropriated by Roy Lichenstein, but some of John Romita’s were. Whether we are talking about Andy Warhol’s soup cans or last year’s Turner Prize nominees, there will always be a certain number of people who react to modern paintings like Peter Parker does -- by wondering if it is really art at all. In 1956, Andy Warhol had dedicated a whole exhibition to elaborate and unlikely designs for shoes; and feet feature prominently in his early work. Indeed, it is often insinuated that he was sexually interested in women's feet. It would be going too far to say that the picture in panel 6 is consciously a parody of an Andy Warhol drawing; but if you were trying to come up with a simple line image of “the sort of rubbish they show in Madison Avenue art galleries nowadays” a toe sticking out of a sock isn’t a bad attempt. But then something very odd happens. Stan Lee sticks in a completely unnecessary thought balloon “Boy! I wish I could draw feet like that!” The balloon partially covers the painting of the foot. And it isn’t coming from anywhere: the person thinking the thought is behind a pillar. This is a bizarre thing to do. Why have a figure who is not in the panel commenting on a painting, when there are two silent figure admiring the stick-man who don’t say anything at all? The most the thought contributes to the scene is to contrast the art-lover, who admires the foot-drawing, with the science student, in the next panel, who doesn't understand the band-aid. He probably has in mind things like the cover and splash page of #19, where Spider-Man’s stockinged feet are represented as rather abstract shapes, without toes or heels. It’s quite hard to find a picture of anyone going barefoot, but when Spider-Man is doing somersaults in his PJs in issue #12 his feet do look a little on the cartoony side. (Something about them said “Popeye” to me.) However “can’t draw feet” certainly isn’t a major hallmark of Ditko’s art in the way a complete lack of teeth and fingernails arguably characterizes Jack Kirby. The received and unchallenged wisdom of Spider-Man fans is that “I wish I could draw feet like that” is a joke at the expense of Mr Fleming. Indeed, it has been said that Ditko inserted himself into his own comic to admire his own feet, but tactfully hid himself behind a pillar. This seems highly unlikely: I doubt that Ditko even read the lettercols; and I doubt if he would have left it a year from the original letter to make the riposte. But it is just possible that Stan Lee misunderstood the Warhol reference, remembered the “Ditko can’t draw feet” remark, and dropped the speech bubble in to explain the joke. When we read Spider-Man it can feel as if we are looking down a tunnel. The pictures tell a story. The words, added afterwords, tell a different story. Characters in the panel do not speak; characters who are not in the panel deliver crucial lines. Cryptic jokes are made by characters hiding behind pillars. There are 24 blocks of text in a 7 panel page. We can never be sucked into the flow of the pictures, we are always made to pause and read the words. Spider-Man unfolds almost in slow motion, with a commentary over the top. Are we listening to a melody and a counter melody; variations on theme; an argument between two creators…or merely a movie where the lip sync is very slightly off? As you say, Warhol's shoe show was in 1956. Whereas already by 1962 Warhol had begun his better known 'iconic' screen prints of soup cans and the like. It seems generally agreed that it was these works which cemented his fame. Does it seem likely that Ditko would remember lesser known material from nine years before? Lol, Dan Fleming is my Uncle, I'm not sure but I think he has several letters still of the two of them going back and forth. I'd be absolutely fascinated if you could give me any more information on this, Dan Fleming's nephew!